The problem with most gardening gloves I’ve tried over the years is that they don’t leave you nimble-fingered enough to perform many gardening chores. For a long morning of shoveling, sure, any decent, lined leather glove will do, but shift gears into perennial or annual planting mode and you’ve soon dispatched with the gloves, because they’re making you clumsy. Those light little “Gripit” gloves are great for fine-fingered work, but they offer little protection while shoveling, raking, or handling stone. This spring, I picked up a pair of Ironclad gloves at Dundee Nursery in Plymouth, Minn. I like them because they fit tight, like reinforced batting gloves. I like them because I can handle stone all day and not only do they protect my hands, I can leave them on when it comes time to deftly pick up a piece of flagstone by the edges. You can leave them on while tying and untying ropes, large and small. You can leave them on when grabbing a hand pruner from its holster. You can leave them on and flick your Bic, for, umm, melting the end of a braided nylon rope. You can leave them on while tearing off the shoulders and scratching up the sides of potted perennials and shrubs, and while plucking out individual large roots from a massed root ball. I like them because they have cool, yellow, raised rubber lettering on the knuckles. I like them because I have beaten the hell out of this pair all season, and they have never let me down—and rarely left my hands. 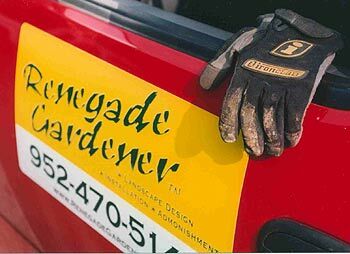 They have a wide range of gloves for gardening. They cost around $25, and are worth every penny. Visit their site at www.iclad.com.